There are nine legislative assembly constituency in Gorakhpur district for the 2017 Assembly elections. They are 327 Bansgaon, 320 Caimpiyarganj, 326 Chauri-Chaura, 328 Chillupar, 323 Gorakhpur Rural, 322 Gorakhpur Urban, 325 Khajani, 321 Pipraich, 324 Sahajanwa. When Uttar Pradesh assembly election 2017 is getting ready to electios new Assembly, Gorakhpur is not anywhere behind in the election heat. 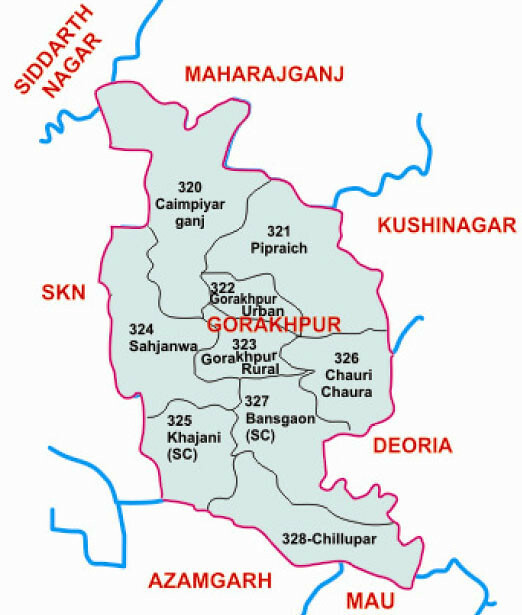 Gorakhpur district (Hindi: गोरखपुर ज़िला) is a district of Uttar Pradesh state in India. Gorakhpur is the one of the major and largest districts of Uttar Pradesh. It is the administrative headquarters of the district.